A quick view of the most influential metrics in Tierrasanta. The community of Tierrasanta is a section of San Diego and is also referred to as "The island in the Hills." Tierrasanta is Spanish for "holy land" or "holy ground" and the symbol for the community is Conquistador cross within a circle. The community stands like an island with no bordering communities, instead it is boarded by freeways, park lands, and Marine Corps Air Station Miramar. The community is largely residential with a strong military heritage. There are several local shopping centers such as the Tierrasanta Town Center that feature chain stores such as Albertsons, Ace Hardware and others. Mom and Pop stores make up a portion of the business base for the area with eateries and drinking establishments making up the rest. In the beginning, Tierrasanta was part of the Mission San Diego de Alcala Ranchand was active from the 1700s through the 1800s. However, in 1941 the land was purchased by the U.S. Military, the Marines specifically and became the home of Camp Elliot. The Marines gave up the location in 1944 and it was used by the Navy for a time and then deactivated entirely in 1946. Fifteen years later, in 1961, the land was sold to the city of San Diego and the Elliot Community Plan was created and served as a guide for area development. A short ten years later the community of Tierrasanta was founded. 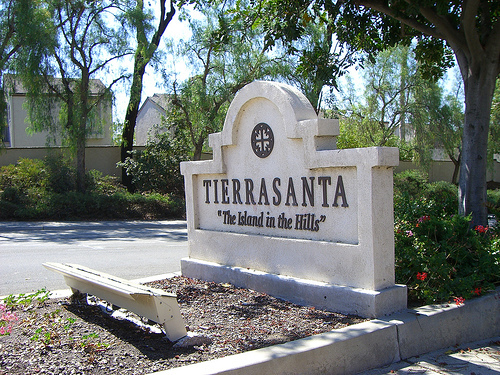 Tierrasanta was one of San Diego's first master planned communities and by 2010 it had a population of 30,443 residents. The community has an elected community council, which has members from of each of the communities eight areas, that work along with the city government on matters of community planning, advisement and local issues. Tierrasanta has been home to many notable residents including skateboarder Tony Hawk, cyclist Chris Horner and author and graffiti artist Erik Wahl. The community features 818 acres of open spaces and landscaped medians to add to the beauty of the area. These open spaces and parks have a variety of trails for walking, jogging and biking as well as sport courts and fields available to the public. Tierrasanta has a branch library and the Tony Hawk Foundation is working to raise funds for a million dollar skate park for the city. This community has a warm, welcoming atmosphere and an abundance of sunshine and green spaces. The community has many top ranked schools and is a part of the San Diego Unified School District as well as featuring a research park and three shopping centers. The housing market consists primarily of single family homes, apartments, condominiums and more. This community has a warm, welcoming atmosphere and an abundance of sunshine and green spaces. Local real estate agents await to help you find the home of your dreams in beautiful Tierrasanta in San Diego, California. View our selection of available properties in the Tierrasanta area. Check out the latest demographic information available for Tierrasanta. Learn more about schools near Tierrasanta complete with ratings and contact information. Browse through the top rated businesses in the most popular categories Tierrasanta has to offer.